Bosch Vision WTVC8530UC Front-Load Gas Dryer with 6.7 cu. ft. 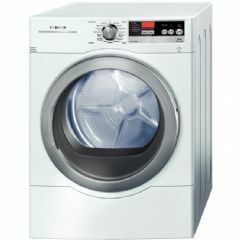 Experience easy drying with the WTVC8530UC from Bosch, which comes with such useful features as the EcoSmart Technology, an array of smart sensors, and the Energy Star seal for energy efficient drying. - This unit comes with the EcoSmart technology, which features a number of smart sensors for targeted drying. - The Eco-Action option reduces energy used by the dryer for up to 10%. - The patented DynamicAir feature dries the clothes using moderate heat and high air volume. - The stainless steel drum makes drying easy and can tolerate faster spin cycles. - The Air Fluff cycle makes drying without heat possible, perfect for drying delicate fabric types and comforters because it dries without added heat. - Wool cycle is perfect for drying wool fabrics. - The Steam Wrinkle Relax Cycle produces loads with less wrinkles by relaxing kinks and wrinkles in the clothes in just 12 minutes. - The Steam Refresh Cycle removes odors in as little as 16 minutes. - You can refresh a full load in just 20 minutes with the Steam Touch Up cycle. - The Delicates option allows you to safely dry delicate fabrics that are usually line dried. - You can use the Synchro Technology for synchronizing the dryer cycle and the washer spins. - For sports clothing and gear you can use the Active Wear cycle feature that is designed to specifically wash athletic gear. - To prevent colored fabrics from losing their vibrant colors, the Dark Color cycle is the cycle to use. - Built-in heat sensors prevent overheating. One of the main advantages of this unit is the three-way venting installation, which makes installation convenient, allowing users to install from the back, right, or the bottom. Another advantage is the extremely quiet performance of the unit, allowing you to place the unit anywhere in the house, even on the second floor. The unit comes with the Energy Star seal allowing users to save as much as 10% in energy bills. The unit is also stackable, which means that you can save up on space. The compact design makes this dryer perfect for small rooms. Finally, it dries efficiently, finishing up on a full load within 50 minutes. Smaller loads such as a load of towels can take as short as 20 minutes. One of the major disadvantages of this unit is that it only comes in one color. Orange rust stains tend to be more easy to spot in lighter colors of dryer units compared to dryers in black and other dark colors. Even with the noise reduction feature, the unit is still noisy. Some users place a pad of felt under the unit to deaden the noise. Join in and write your own page! It's easy to do. How? Simply click here to return to Bosch clothes dryers.